The next movie-quality accessory from armor/prop maker Anovos is coming very soon, letting you live out your wildest Rogue One: A Star Wars Story fantasies. The popular maker of stormtrooper armor (and other movie-quality accessories) has officially released their Shoretrooper Helmet for pre-order, and it's shipping in January 2017. 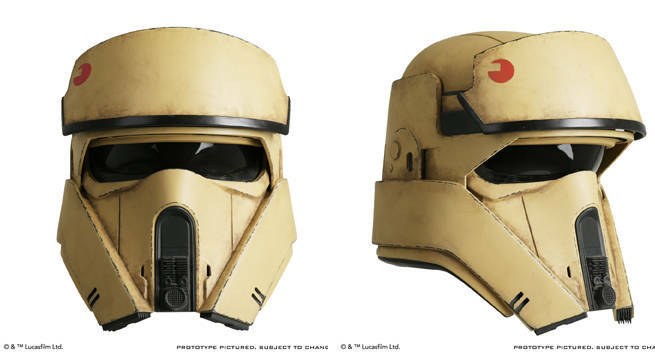 The movie-quality helmet features the tan look of the new stormtrooper variant introduced in Rogue One on the paradise planet of Scarif. Their armor is designed specifically for combat in sand and shallow water - though the actual beach combat seen in the trailers was largely cut from the movie. Interestingly, in the film, we see the shoretroopers simply running alongside the rank-and-file stormtroopers, possibly indicating the custom armor is a privilege of rank, not just made for specific locations. Anovos is already sold out of pre-orders for wave one of the officially licensed Shoretrooper Helmet, but plans to ship both waves one and two in January 2017. If you pre-order, you get the helmet for $75 off - $499 instead of the full $575 price, which will be the going rate as of January 1. "Specialist stormtroopers stationed at the top secret Imperial military headquarters on Scarif, Shoretroopers patrol the beaches and bunkers of the planetary facility. ANOVOS is proud to offer the ROGUE ONE: A STAR WARS™ STORY Shoretrooper Helmet Accessory. Items are subject to change in availability and features. This is not a toy. Not suitable for children. Does not offer protection. Helmet size adjustment system ensures a comfortable and secure fit." Anovos armor is quite impressive in-person, so much so that you can even spot some of it on campus at the Lucasfilm offices, a fine nod. Other Rogue One products include a Death Trooper Helmet, a new edition of the Imperial Stormtrooper kit, a new edition of the Darth Vader Helmet and full Costume, and the Imperial TIE Pilot Helmet and full Costume. Check out the full detailed looks at the Shoretrooper Helmet below.